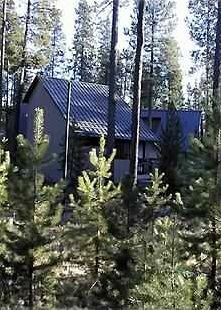 Freestanding cabin in beautiful Sunriver, Oregon! Our cabin is knotty pine on the inside. It features a loft with a king-size bed and a separate full bathroom with stack washer/dryer. Downstairs has a separate bedroom, a double bed with a half bath. There is a full kitchen which is open to the living room. Linens, all kitchen appliances and utensils are provided. One side of the living room looks out onto a full deck, facing lodgepole pine trees. Our cabin is about eight-tenths of a mile from the store/mall area and is about one-fourth of a mile from the Deschutes River. We have six bicycles and a canoe at the cabin. There are 6 (six) SHARC passes on lanyards for our guests to use at the aquatic center. Lost passes cost $100, please return to cabin! We do not allow pets. Our guestbooks are full of comments about how homey and comfortable our cabin is! Sunriver has over 30 miles of bike paths and three, 18-hole championship golf courses. Mount Bachelor is only 18 miles away and has some of the best downhill skiing available in the West. There are also many cross-country ski parks nearby. Sunriver has 29 tennis courts and two public swimming pools with waterslides and saunas. There is a private airport in Sunriver, a marina, horse stables, and seasonal ice skating. There is an observatory, nature center, and more activities available to all ages. Several quality restaurants are located within Sunriver, as well as two grocery stores and unique shops in the outdoor mall area. The lodge can provide more information for visitors. Bend is about 20 miles north of Sunriver. I am a dental hygienist and my husband is a retired school teacher. We have an adult daughter who just had our first grandchild on Christmas 2018! We live in the Applegate Valley, with a miniature horse, chickens and a dog. We like to fish, sail, and camp in our spare time. We spent many years building our home in the Applegate Valley and are enjoying the fruits of our labor. My husband love to sail and has gone on a couple of vacations to the San Juan Islands and recently to the Channel Islands in California. I work 3 days a week for a local dentist. I've been a hygienist for 41 years and love listening to people and actually love my work! I also spend time on an internet website directing people to correct information and resources and also raising awareness of Kawasaki Disease. My daughter had this when she was 6 years old and it has left her with some heart damage. I also buy and sell some collectibles and antiques, which also means I am a collector also. God is good though and we all have full lives! We chose to buy a cabin in Sunriver after spending our honeymoon there in 1987. We had done a lot of cross-country skiing, bike riding, playing tennis and loving the beauty of the area. At the time we had a little extra money and this cabin fit into a budget we could afford. We have updated it over the years and put in new carpet downstairs, new vinyl, new shower stall, and new hickory cabinets for the kitchen this summer of 2011. We also have put in two 8 ft sliding doors and one new 6 ft slider in the living room. We have spent so many holidays there.....Chistmas and Thanksgiving....Spring Vacations.....it NEVER gets old. There is always something going on in the area, from the fantastic festivals, to functions/dinners at the Great Hall, to the observatory events...too much to describe! Outside of Sunriver there is the Lava Tube Forest, the High Desert Museum, South Century Drive to the mountains and lakes, snow parks abound. It truly is a very special area. Staying inside the cabin offers the peace of relaxation, sitting on the deck with coffee, reading or taking a nap. The environment in Sunriver is just a perfect place for a vacation and caters to every kind of vacation experience imaginable! Within a mile or so of Sunriver Lodge. SIX (6) SHARC Passes included with rental. Must be returned to cabin before checkout . Ask to see about getting passes to pool area. Having rented in Sunriver many times, the accommodation is not fancy, but everything is clean and functional, quite comfortable, and priced very fairly. We had a great stay here. Everything was clean and organized. The house was very well stocked. We will defiantly be back for another stay! First of all It was hard to find the cabin at night. Second the furnishing were adequate but very tired, several pieces of furniture were broken. The instructions for the cabin were not in one location but on notes in different places. Stairs to loft were pretty steep a bit difficult for my wife and i to negotiate. Outside stairs had no hand rails, and because they were icy made it difficult. Kitchen was well stocked and it was warm inside. This is a nice quiet cabin for your family trip away. The cabin was clean and comfortable but if you are pillow sensitive be sure you pack your own. Located about a 15 minute walk to the village and 30 minute walk to the Sharc you will get your steps in daily. The walking and bike path is a great way to start each day. Upon arrival you feel like you have arrived at your parents cabin and it feels like home. The owners are welcoming and responsive should any concerns or question arise. first time staying at Sunriver and we had a great time. house was perfect for our family and was very comfortable and good location. would definitely stay again. Loved it, everything we needed was there. Holiday Rates for Memorial Day weekend (3 nights), Labor Day Weekend (3 nights), Thanksgiving (4 nights), Christmas Vacation (4-5 night stays negotiable) Dec 19 to Jan 2, 2015 , $130 a night. ALL RESERVATIONS INCLUDE A 12% FEE FOR 6 SHARC PASSES. The taxes are split 8% for the bed tax and 12% for SIX (6) SHARC passes that are to remain in the cabin when guests leave.